A new solution for predictive maintenance and control is now available from Omron Industrial Automation Europe. It is our first Sysmac library for artificial intelligence for an AI machine automation controller, the first in the industry*, and fuses control functions of manufacturing lines and equipment with AI processing at manufacturing sites in real time. This powerful solution can help manufacturers reduce the risk of equipment damage and downtime by detecting issues early on and prompting immediate action to resolve them. Customers will be able to take advantage of our advanced technology and our team of data scientists to facilitate predictive maintenance and to prevent sudden stoppages. The process of collecting raw data from machines is completely automated by the new AI controller which operates on the “Edge” within the machine, ensuring higher data fidelity and consistency. In addition, the controller automatically creates data models from correlation analysis and monitors machine status based on that model. Without this automation, machine designers and operators would otherwise need to develop their own analytics and optimization capabilities in order to avoid cloud solution costs. The AI functionality in the controller is able to identify unforeseen machine behaviour, without being explicitly programmed to do so. Since there could be many different factors and measurements that indicate an issue when observed together, automating the feature extraction process saves a significant amount of time and resources. Leveraging the machine learning results during production is key to ensuring end user cost savings. Rather than being a cloud solution, our unique approach to AI-based control involves hardware, software and in-person service. No internet connectivity is required. 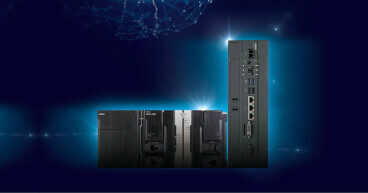 The hardware is based on the Sysmac NY5 IPC and the NX7 CPU and includes Omron’s AI Application Components, a library of pre-programmed predictive maintenance function blocks, based on the know-how that we have gathered from typical applications. Several additional AI specific utilities are also included, such as the Time Series Database Function, which collects and accumulates time series data synchronized with the control cycle at high speed, and the AI Engine, which detects unforeseen abnormalities at high speed and accuracy based on the data. We work with our customers to accomplish our original manufacturing innovation concept, "innovative-Automation". With the AI Controller and Sysmac Library, we accelerate the realization of intelligence for automation. This enables a factory of the future, where humans and machines collaborate in harmony to reduce machine downtime, maximizes performance, and achieve zero-defect equipment. *1) Based on OMRON's investigation in November 2016.